If you’re living in Belgium and want to travel and meet new people without the hassle of planning and organising sit back and relax because the Brussels Expat Club is here. When you’ve just landed in a new country, it’s exciting and overwhelming. You want to meet people, but it can be difficult. You want to travel, but planning and transportation can be complicated, especially when you’re busy finding your way in a new job and a new culture. That’s where Expat Club comes to the rescue. What is the Brussels Expat Club? Dutch expat, Edgar Hütte, had the idea for Expat Club when he noticed his fellow expats wanted to get out and meet people in Brussels over fun experiences, but they didn’t have the time or local knowledge to organise events themselves. Edgar began arranging events through meet-up websites and, since then, Expat Club has grown into a welcoming and active community of internationals who meet to explore destinations in Belgium and beyond. 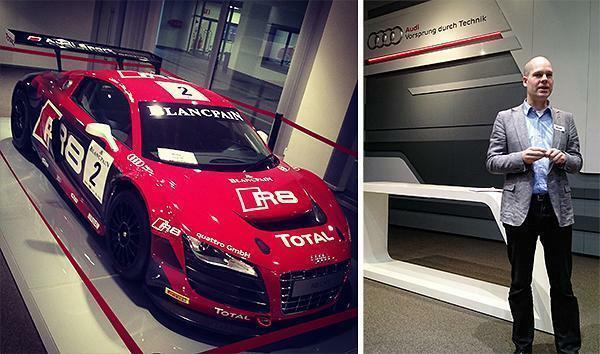 Andrew joined up with Edgar and the Expat Club for a visit to the Audi Factory in Brussels. Here’s what he had to say about the event. Visiting a car factory isn’t something on the top of most people’s to-do list, especially on a Friday night. Nevertheless, as Edgar was genuinely enthusiastic about it, I joined about 70 other people, all with different interests, at the Audi factory. Before we were even half-way through the tour, I was hooked. If you’ve been in Belgium for a while, then you’ve likely noticed quite a few car dealerships are owned by the D’Ieteren family. In 1948, they built the initial factory in the south of Brussels to produce Studebakers. In 1954, they switched to Volkswagen Beetles; followed over the years by the Passat, Golf, and Polo. Today, the plant builds various models of the Audi A1, which are shipped around the world (except North America). As we walked through the plant in three groups, we learned about the history of the factory, how the cars are produced, and how Audi controls their brand image. I enjoyed watching the robots build the cars. Seeing the machines at work is like watching a well-choreographed dance that is simply mesmerizing. If you are at all interested in process automation, operations management, or robotics, this tour is a must do. Even if you’re not, the history of the factory and the brands (Volkswagen, Porsche, and Audi) is equally fascinating. Visiting the factory was not only an educational experience; it was also a great way to meet people. Through the shared experience, you find yourself discussing what you learn. This leads to further discussions and, hopefully, a connection is established. It still feels weird to say, but I highly recommend the Audi factory tour. After hearing Andrew rave about the Audi tour, I knew I needed to check out the Expat Club for myself. When I learned the club would be visiting Champagne, I was in. After nine years in Belgium, we still hadn’t visited this beautiful region of France. I am a huge fan of bubbly, and I had been dying to see where it all began. Having a chauffeur driven luxury bus, so neither of us had to worry about driving, was the icing on the cake. We stumbled up to Schumann, before the sun came up on Saturday morning, and were impressed to see how many people were joining the trip. Right off the bat, we met someone from Nova Scotia, as well as expats from Germany, Italy, America, Australia, Bulgaria – a United Nations of expats. We were even thrilled to meet a loyal CheeseWeb reader in the group! We boarded the double-decker bus and, after another short stop at Midi station to pick up the rest of the group, we were off. 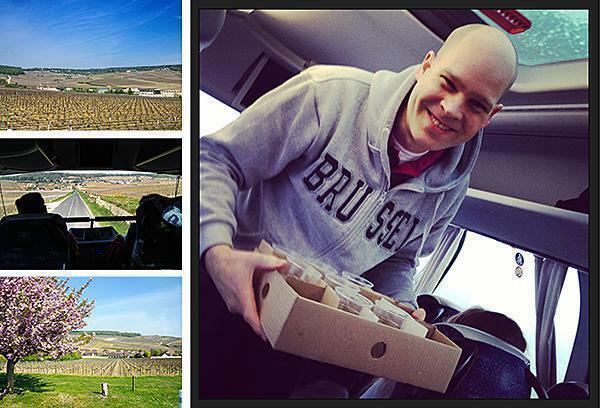 En route, Edgar treated us to juice and waffles – a Belgian start to our French adventure. It was lovely to be able to sit back, relax, and not have to worry about a thing (a rarity for us I assure you!) The only thing we could have asked for was a big thermos of coffee! Arriving in the Champagne wine region of France, (now found within the Grand Est region) we cruised down the renowned Avenue de Champagne, in Épernay, home to some of the most illustrious Champagne houses. 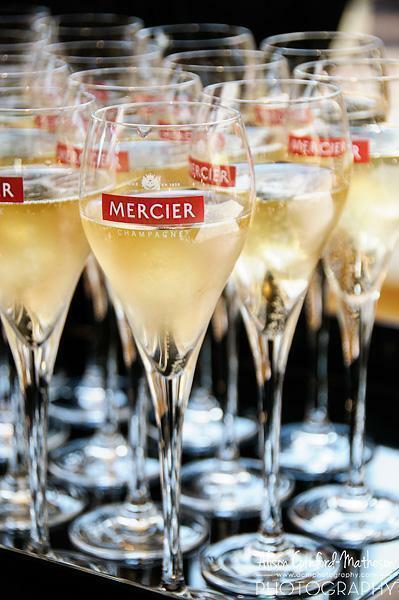 Our first stop was Champagne Mercier – what a way to start the visit! 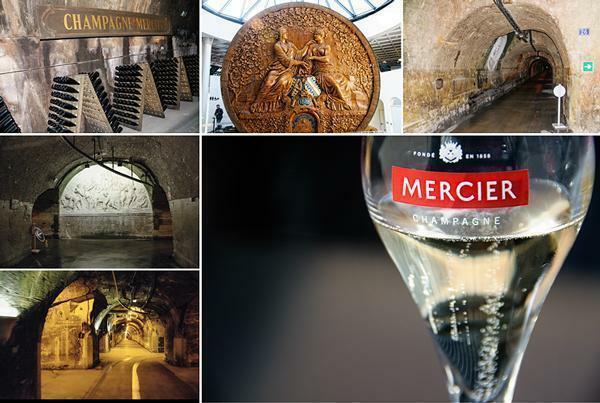 Founded in 1858, Mercier has some of the most extensive networks of caves in the region. Guests can explore a small portion of them, via an electric train. The tour is accompanied by an audio-guide, explaining the history of the Mercier house and the making of their Champagne. It’s a quick but fascinating trip, and the caves seem endless. 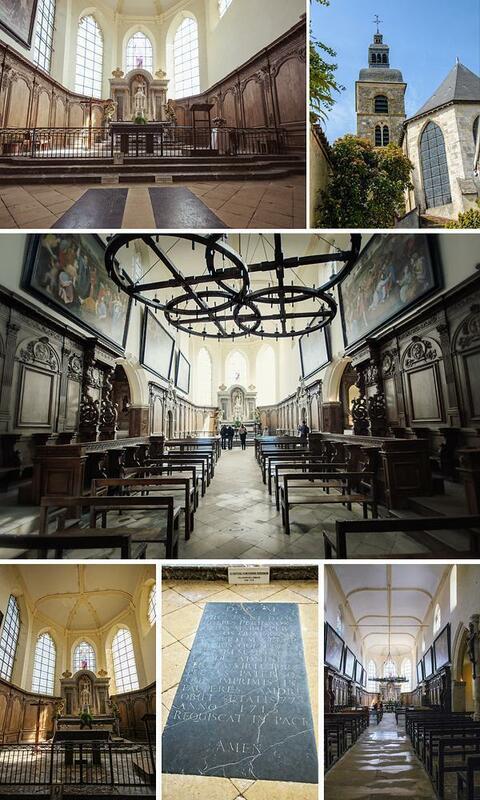 We had a lovely lunch at the Restaurant de l’Abbaye and then took a quick peek inside the church where Dom Perignon is laid to rest. After paying our respects, we nipped across the street for another glass of bubbly. Then it was back on our bus for a short ride to Reims, the largest city in the region. After driving by a few more big names in bubbles (Taittinger, Veuve, Pommery) we arrived at Champagne G.H. Martel. Contrasting with Mercier’s ‘tourist attraction’ feeling, Martel maintains its family-run atmosphere. We descended into the cellars, dug from chalk quarries, and learned about the history of the Champagne house. 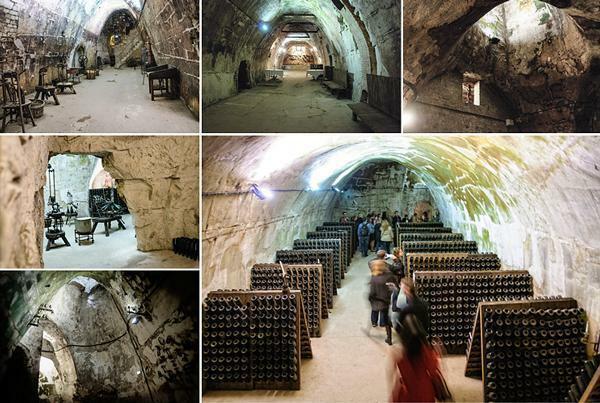 Martel’s Champagne is now made in a large, modern facility, but the old caves are used as a historical museum to the ancient traditions. Meeting CheeseWeb fans in the wild during the Martel Champagne tasting. 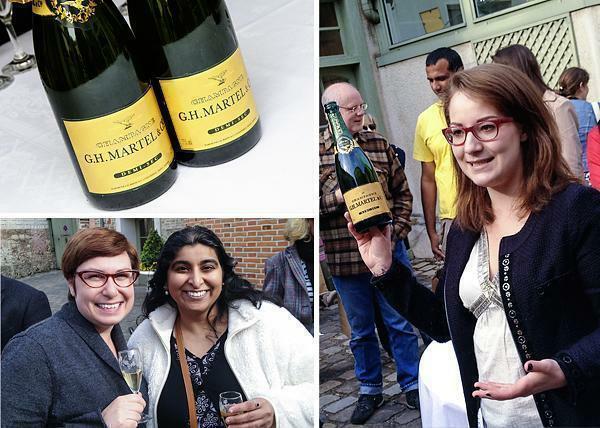 The Martel tasting was held in the pretty courtyard, where there was a relaxed and unhurried atmosphere. It would be a beautiful spot to enjoy a lazy summer afternoon. 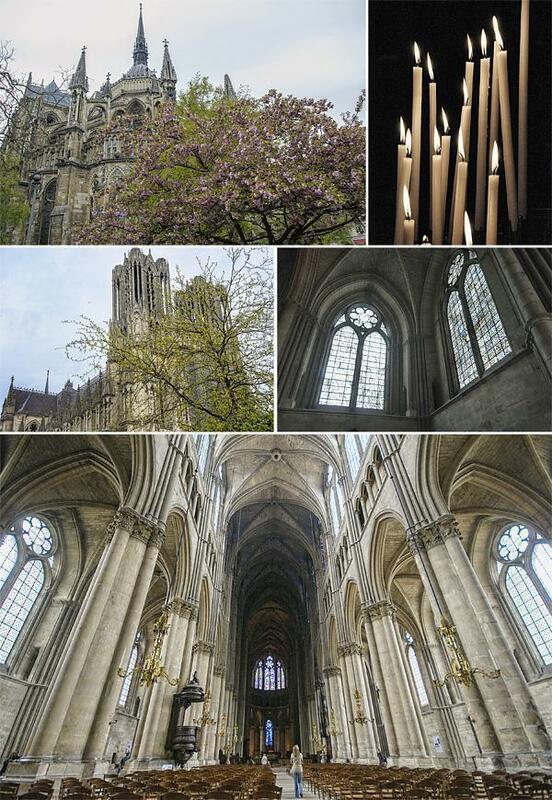 After Champagne Martel, we had a few hours to explore Reims on our own. 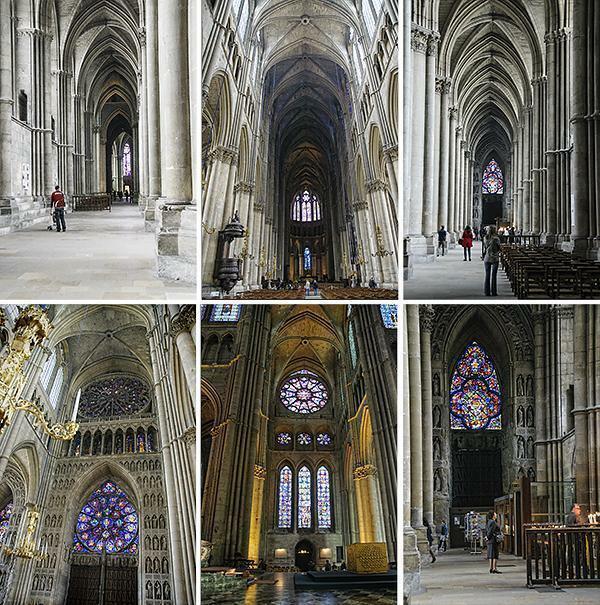 Of course, my first stop was the UNESCO listed cathedral. It was stunning. Beyond my obsession with UNESCO sites, I had another reason for visiting. 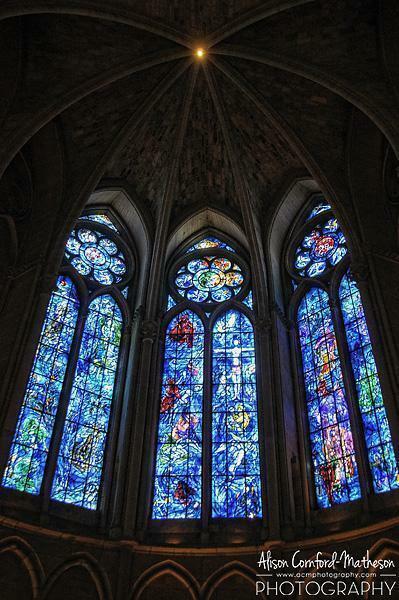 One of my favourite artists, Marc Chagall, designed one of the stained-glass windows and I was eager to see it in person. I wasn’t disappointed. 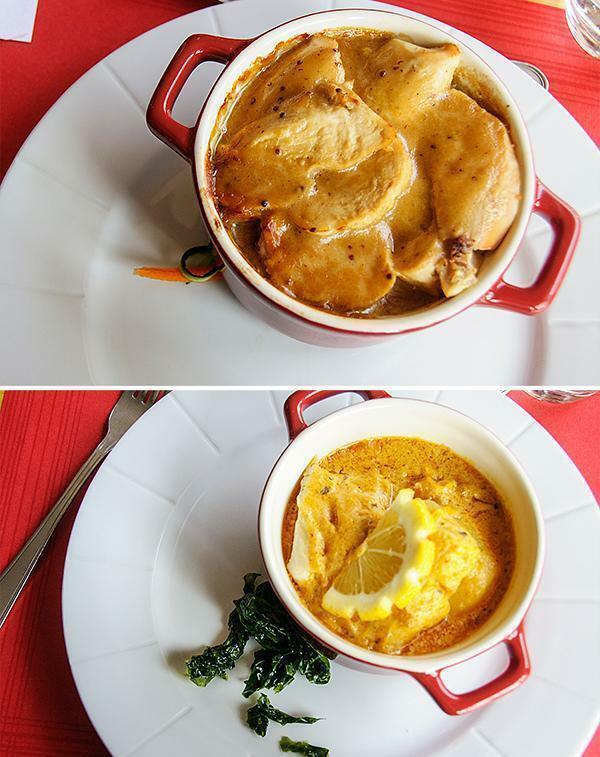 We strolled through Reims and had a quick supper, deciding the city is definitely worth a longer return visit. Then it was back on the bus for a late-night return to Brussels. 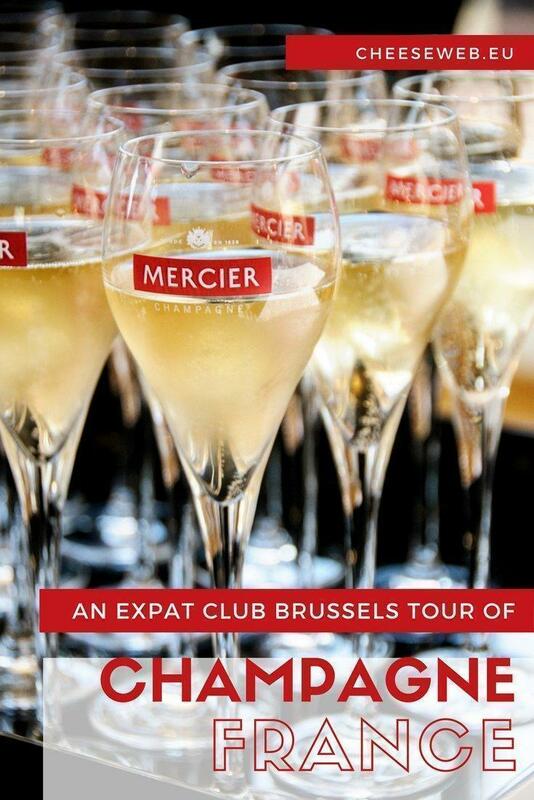 Visiting Champagne with the Brussels Expat Club from CheeseWeb.eu on Vimeo. Our verdict – We thoroughly enjoyed our visit to Champagne with the Expat Club. The day was extremely well organised, yet left some time to explore on our own. 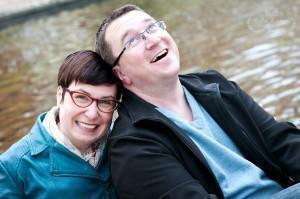 We didn’t have to drive or do any planning, which made it relaxing and stress-free. We met a fun group of active expats, from around the world, and tasted some excellent champagne. View Expat Club’s upcoming events or subscribe to their mailing list to receive notifications by email. 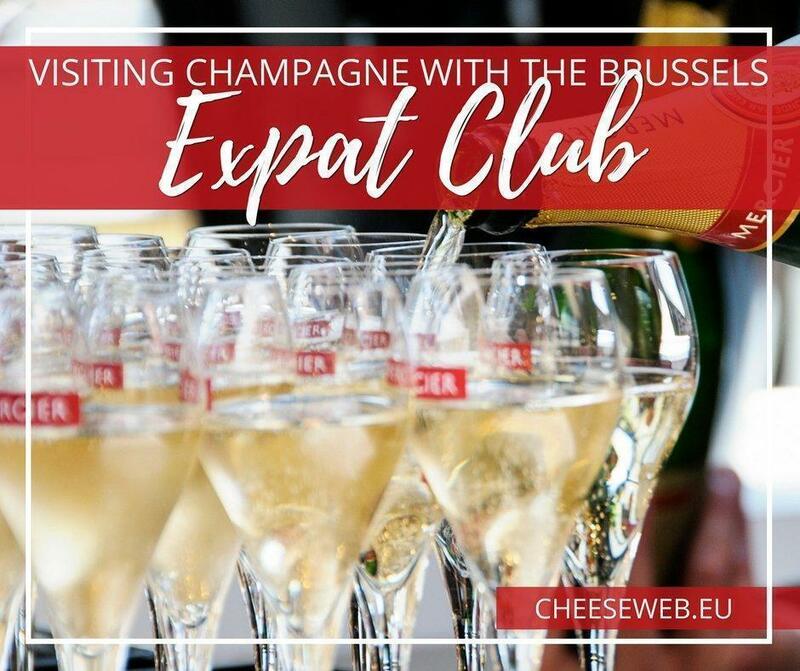 We’d like to thank Edgar for inviting us to join the Expat Club on their visit to Champagne and provide you with our honest review of the service. If you are planning a visit to Champagne, why not also read about Adriana’s weekend escape to Champagne. It is a beautiful spot to reconnect with your partner.